1 Violations of the Minor Offenses Act, etc. Fig. 1-2-2-1 shows the number of persons newly received by public prosecutors offices for violations of the Minor Offenses Act (Act No. 39 of 1948), Firearms and Swords Control Act, Amusement Business Act, and Anti-Prostitution Act (Act. No. 118 of 1956) over the last 20 years (See Appendix 1-4). 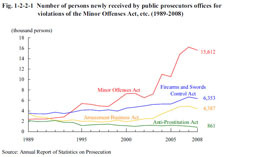 The number of persons received for Minor Offenses Act violations had been on an increasing trend from 2003, but decreased by 3.6% from the previous year in 2008. The number of persons received for Firearms and Swords Control Act violations and for Amusement Business Act violations have both also been on an increasing trend, but decreased by 4.5% (id.) for Firearms and Swords Control Act violations and by 10.5% (id.) for Amusement Business Act violations in 2008. Recently the Firearms and Swords Control Act was amended by Act No. 120 of 2007 (enforced on December 30, 2007), which established aggravated punitive clauses for firing or possession of handguns, etc. and possession of more than one handgun. In addition, penal provisions were tightened on the import, etc. of handguns or ball cartridges for the purpose of profit, violations of restrictions on the firing of approved firearms, and violations of the prohibition on carrying knives. The amendment by Act No. 86 of 2008 (enforced on January 5, 2009) expanded the scope of prohibition on possession of swords by lowering the length of the blade from 15 cm to 5.5 cm. In order to prevent offenses involving invasion to a residence, the Act on Prohibition of Possession of Special Picking Tools, and Other Related Matters (Act No. 65 of 2003; enforced on September1, 2003 (partly on January 20, 2004)) established penal provisions for possession of special picking tools, etc. The number of persons newly received by public prosecutors offices for violations of the said act was 581 (down 3.6% from the previous year) in 2008 (Source: Annual Report of Statistics on Prosecution).